The 42nd Trigantius took place in a spring-like Cambridge, again held at the University Social Club in Mill Lane. A recent record of 56 players (including two ghosts) meant the event got off to a late start. In addition in the afternoon there were 28 players in Paul Smith's Novices Tournament making it even more popular (though more crowded). This number included four adults and a large group of pupils from Harpenden Academy. The main tournament saw the return of Sam Aitken (3d) who won all three, including a win secured against Andrew Simons (4d Cambridge), to become this year's holder of the Trigantius Trophy. Other players on three wins were Alison Bexfield (1k Letchworth), Matthew Reid (1k Cambridge) and Sebastian Pountney (8k). 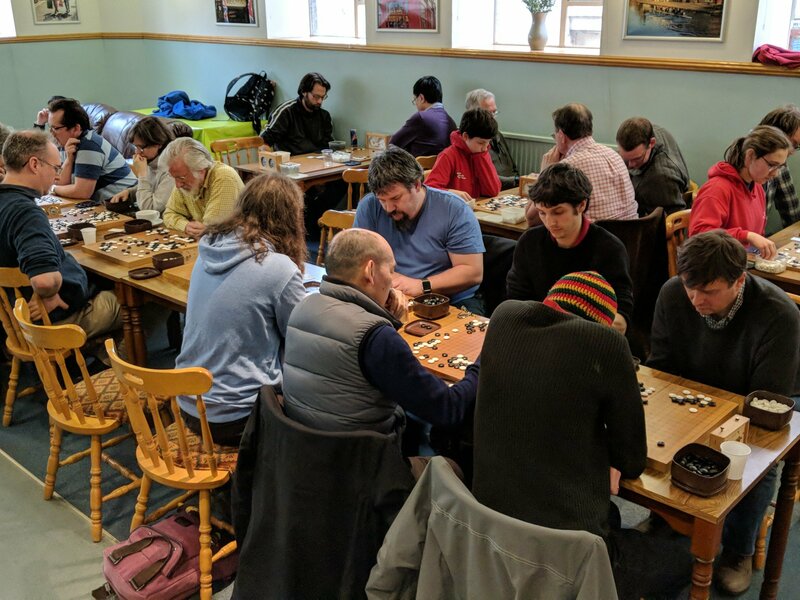 The organisers also awarded a prize for the next best-placed single-figure kyu-player, Chenyi Li (1k Winchester), on two wins and for the best-placed double-figure kyu-player, Neil Sandford (15k Edinburgh), also on two wins. In addition the Novices' organiser rewarded three junior players who won two in the main tournament (Hilary Bexfield, David Baldwin and Zoe Walters). The winner of the 13x13 side tournament was Hilary Bexfield, with 4 wins. More details of the Novices' are awaited, but it is known the winner was Neil Bai (aged 10 from Cambridge) and the runner-up Yanyi Xiong (aged six from Cambridge). Third place was a three-way tie: Yize Gao (Cambridge), Monty Ives-O'Brien (Harpenden) and Ben Lindsey (Letchworth). In the evening a group of more than a dozen players met for a well-earned curry in Mill Road.